Melnor oscillating sprinkler comes fitted with a flow control system and 20 precision nozzles that ensure jetted water from the nozzles covers a wide area. A notable feature is its TwinTouch control system that helps the gardener make an adjustment to the width and range of the watering pattern. We are quite happy with the performance. Although Melnor oscillating sprinklers comes with a metal case that helps you fasten it in place, it’s a little heavier than those without a metal case enhancement. Our team of technical experts carried out through tests on the Melnor oscillating sprinkler and the results obtained were quite impressive. The Melnor Oscillating sprinkler comes neatly packaged in a cardboard paper box that displays many useful features and options needed for watering your lawn or garden without stress. The packaged sprinkler is easy to use right out the box with little to no coupling experience needed. The 3-way adjustment system of the Melnor Oscillating sprinkler is one of the best features of this device. You can confidently use the tabs control buttons to adjust the range and watering patterns for high precision watering. The TwinTouch system helps control the width so that you can narrow the watering area to fit into a large or narrow lawn. Finally, the zoom control system helps adjust the watering area. This feature is useful if you have to zoom in on a particular area in your garden or you need to water an entire flower bed. Melnor oscillating sprinkler comes enhanced with an infinity drive turbo Motor that runs smoothly with your sprinkler system with little to no noise at the background. Nozzle: Of all the parts our team looked into, one of the most notable parts is the bright orange/yellow colored nozzles. You can’t miss it. They are responsible for adjusting the width, flow and length of water nuzzling out from the nozzle. Flow Control Knob: The flow control system is another easy part to spot. Located just at the side of the sprinkler device, a little twist of the knob and you control how much water you want coming out of the oscillating sprinkler, just like the impact sprinklers. The flow control knob is a useful feature that saves you the hassles self-controlling the flow rate at the spigot. Collar control: By the side of the flow control knob is a collar like material that can be used to adjust the length of whatever spray pattern you choose. How far back or forth you want the spray pattern to reach, is determined by the adjustments made by the collar. You can also make an adjustment to the collar to move the spray in one direction only. Width control Levers: The width control levers are located at the middle of the sprinkler on both sides of the nozzle. They aren’t the easiest part to use and will take a bit of getting used to before you master them. One drawback is that you constantly have to adjust the width to the desired distance while you are being blasted by water from the nozzle. You will need constant practice, monitoring the nozzles to understand how they work hand in hand with the width adjustment levers. Or you can upgrade with one of the sprinkler controllers to make these easy for you. The nozzles move in a particular fashion anytime the width levers are adjusted, knowing how this works will save you time and prevent you from being soaked in water. Apart from the major parts discussed, there are other minor parts that help the oscillator function properly. A hose connector at the side is fortified with a washer to prevent leaks and dirt from damaging the sprinkler’s nozzles and moving parts while it is connected to your garden hose. To make connections less tedious, a large plastic grip with movable knobs surrounds the washer. Lastly, at the other end, opposite to the hose connector is a removable nozzle cleaner. The cleaner has a rod-like structure that you can use to poke out little debris out of the nozzle holes. To minimize water loss, it is highly recommended that you run your sprinklers in low water pressure. Unless you have a large lawn to water, avoid using high water pressure that has the potential of jetting water over a long distance. Our team found out that the Melnor oscillating sprinkler works best in a square area. So if you have a circular garden, you will be better off with a sprinkler built specifically for circular gardens. 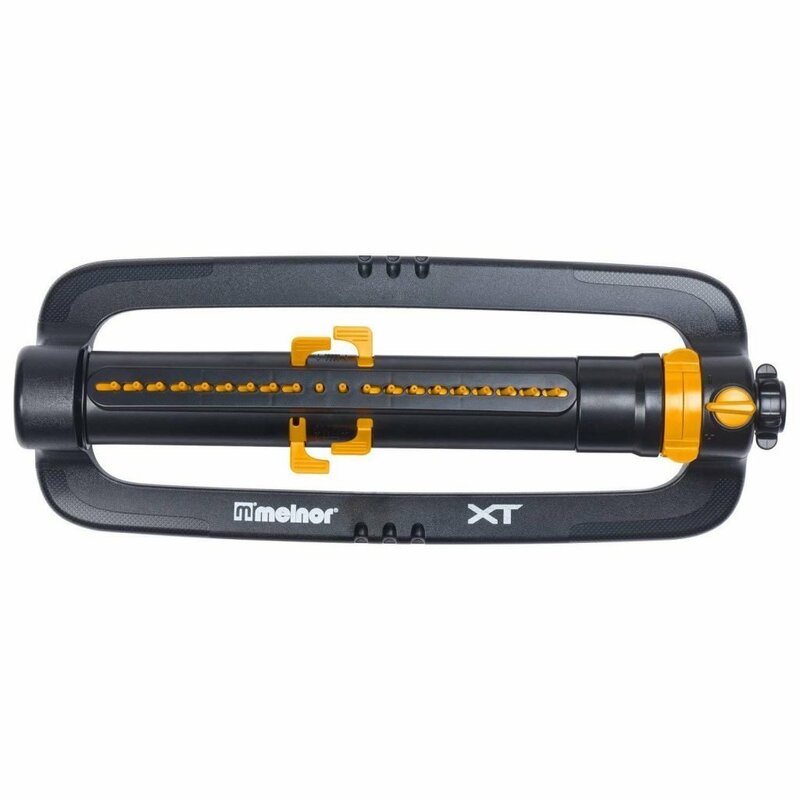 There is a limited lifetime warranty on the Melnor XT turbo oscillating sprinklers. 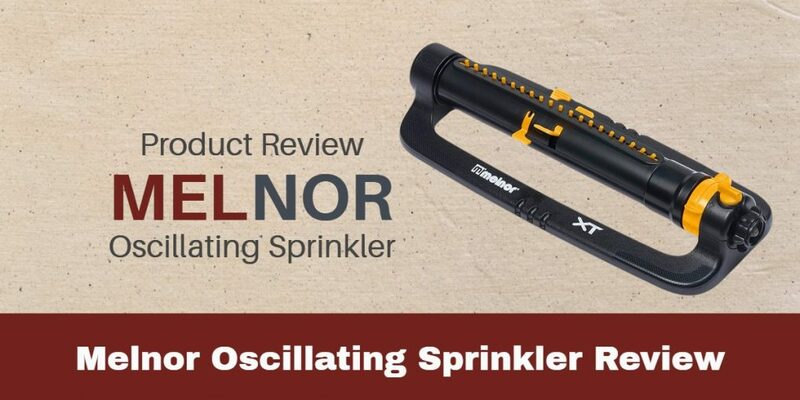 We are optimistic about the performance of the Melnor Oscillating sprinkler over a long period. Judging by the test we carried out and the numerous positive feedback from users, it is a sprinkler that is worth every penny.